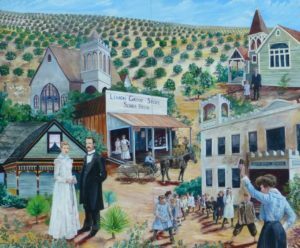 For thousands of years, Lemon Grove was part of the ancestral homeland of the Kumeyaay Indians. The Kumeyaay Nation encompassed parts of today’s San Diego County, Imperial County and Northern Mexico. 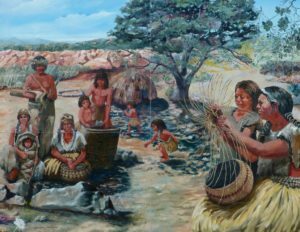 The Kumeyaay lived in both permanent villages and seasonal encampments. Indians followed and camped along Chollas Creek which runs through Lemon Grove to the San Diego Bay. San Diego Bay is discovered by Juan Rodriguez Cabrillo. Spain establishes a military outpost or “presidio” in San Diego. Mission San Diego de Alcala established. Its lands will include modern day Lemon Grove. Cattle and horses were imported from Spain. Mission Indians would tend herds that could graze freely on Mission lands. Mexico wins its independence from Spain. Mexican government land grants give rise to the huge cattle ranching operations that characterized the era. These “ranchos” become the dominant institutions in Mexican California. Mexico begins to close Catholic Missions and seize church property. 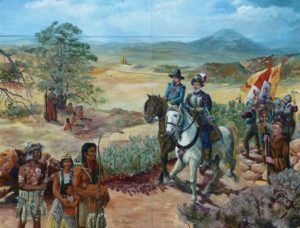 “Mission” Indians work as serfs on Mexican ranchos. Don Santiago Argüello receives a Mexican Land grant of large area of former Mission Lands including modern day Lemon Grove. The grant is not recognized by the U.S. Government until 1876. War breaks out between the United States and Mexico. The first US military post is established in San Diego. Mexico relinquishes its claim to California at the end of the Mexican-American War. The Treaty of Guadalupe Hidalgo sets in motion border issues that continue into the twenty-first century. Military mail service starts between San Diego and Yuma. The route follows the Tijuana River to Campo. California is admitted to the Union as the 31st state. Capt. Nathaniel Lyon, heading east from San Diego through the Chollas Valley and Lemon Grove, finds a new route to the deserts east of San Diego. His route was the precursor to the wagon road (“Campo Road”) and modern day State Highway 94. “Horton’s Addition” is laid out, marking the beginning of modern San Diego. The first mail contract is signed providing mail service from San Diego to Yuma, Arizona. The terms of the contract required the building of a “light wagon” road. The route will pass through Lemon Grove and Spring Valley, to Campo and beyond. Construction begins on a stone bridge across the Sweetwater River at Jamacha. Sheep breeder, Robert Allison, purchases 4,200 acres of land known as “La Mesa Springs” from heirs of Don Santiago Argüello. The area would become known as Allison Springs. It covered an area including modern day Encanto, La Mesa, Lemon Grove and parts of Spring Valley. Regular stage service begins between San Diego and Campo. The twice weekly stage carries passengers and freight. The route varied, sometimes going through Lemon Grove, Spring Valley and crossing the Sweetwater River at Jamacha; sometimes traveling further south through Paradise Valley or Telegraph Canyon. The County of San Diego surveys a route for a new road to El Cajon atop “the Mesa.” This route will become the “Cajon Road,” later Highway 80 and now El Cajon Blvd. A rail line running north from San Diego reaches the Southern Pacific rail line in Colton, California. The line connects to transcontinental rail routes in 1885 (near Barstow). A real estate boom in Southern California brings people from across the United States to San Diego. The first “public” high school in San Diego County opens in the Russ Grammar School building. In 1907 a new building would be added and the school renamed San Diego High School. A railroad line is built from San Diego through Allison Springs (Lemon Grove and La Mesa), El Cajon, and Lakeside ending at the town of Foster. From Foster, stage lines deliver newspapers and mail to towns along the “Julian Road.” The rail line carries passengers, agricultural products, quarry products and supplies for a growing back country. A fire started by a locomotive on the grade between Lemon Grove and Spring Valley burns hay crops. The San Diego, Cuyamaca and Eastern Railway (S.D.C.& E.) pays $1,603.14 in damages to ranchers. The first Lemon Grove Store is opened by A.E Christianson (who dies in 1893). Mortimer P. Bond operates the store in 1892-4. Henry Brand takes over and is named postmaster in 1895. Joseph Kleinfield runs the store from 1896 to 1903. The original building burns down in 1906. Joseph Allison files a subdivision maps for “Lemon Grove.” Henry L Brand purchases the first lot and builds the third house in Lemon Grove. William and Mary Ann Troxell build the “Troxell Manor” on Olive Street. It is the fourth house built in Lemon Grove. The Lemon Grove Fruit Growers Association was formed. The Lemon Grove School District is formed with some 15 pupils. The first classes were held, briefly, in William Hurst’s barn on Central Avenue before moving into a small house on which a bell tower was attached on the corner of Central Avenue and Olive Street. Sherman R. Allen is appointed Lemon Grove’s first postmaster. George and Ida Troxell build a handsome house north of Broadway. The two-story Victorian had a wraparound veranda and gingerbread, and was flanked by a pond, corn field, and vegetable gardens. 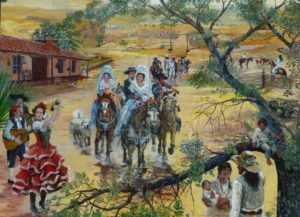 It served as a stage coach stop along the road from San Diego through Chollas Canyon and onto to Spring Valley, Jamul, Campo and points beyond (which is the route of modern Highway 94). Today, the property is the site of The Home Depot. The First Congregational Church of Lemon Grove is organized by the Rev. Isaac Atherton. The original San Diego, Cuyamaca & Eastern Railroad station was built. Sunset View Ranch. Levi Greer builds large Victorian home on his 60 acre ranch. He dies in 1899. The home was purchased by Henry Hill, a Civil War veteran and wealthy Montana pioneer merchant and land owner. In 1931, during prohibition, Walter Trudeau would run a bootlegging operation from the ranch. The home was restored in 1987 by Rurik and Margaret Kallis. Fels Ranch House is built. The Fels Ranch would cover approximately one fourth of modern day Lemon Grove. The First Congregational Church of Lemon Grove builds Atherton Chapel on Main Street. Anton Sonka opens a general store, A. Sonka & Son, near the railroad station. Due to its location along a rail line and the roads to Julian and Campo, the store will be the principal merchant for much of San Diego’s east county, south of El Cajon. Anthony “Tony” Sonka, Anton’s oldest son, is named postmaster, a post he holds until 1940. The McKeen Motorcar — a self powered rail car – provides passenger service between San Diego and Foster with stops at Lemon Grove. A two-story schoolhouse, “The Castle,” is built at Main and Central for 60 pupils and four teachers. It remains in use until it is torn down in 1924. San Diego Gas and Electric Company power lines reach Lemon Grove. Piped water is installed in first homes. Natural gas lines reach Lemon Grove. La Mesa — Lemon Grove’s neighbor to the north — incorporates. The first Lemon Grove Chamber of Commerce is formed by Anthony Sonka. La Mesa, Lemon Grove and Spring Valley Irrigation District is created. Dr. Charles Good, dentist, local orchardist and builder of the 1912 general store, elected to the San Diego County Board of Supervisors, serves 1915-1930. Dr. Good becomes famous for “Good’s good roads” in the back country. The Independent Stone Company operates a small stone quarry (felsite) on the hillside north of Lemon Grove near the railroad tracks. The crushed rock is used as construction aggregate. The company is sold in 1920s and the quarry is closed. The Hatfield Flood washes away roads and bridges. The San Diego and Southeastern (formerly the San Diego and Cuyamaca) Railroad tracks were knocked out leaving Lemon Grove isolated. Hunters Nursery is established along Sweetwater Road. In 1996 it will lose much of its growing grounds to the SR-125 freeway right-of-way. County of San Diego completes the Encanto-Lemon Grove-Imperial County Highway. The Grossmont High School District is formed. Grossmont High School would open in 1922. The Forward Club (a.k.a. The Women’s Club) builds a large clubhouse at 2010 Main Street. It becomes the social center of Lemon Grove. Today it stands on the campus of the First Baptist Church. Lemon Grove Grammar School is built at Lincoln and School Lane on the site of future Golden Avenue Elementary and Lemon Grove Middle Schools. The La Mesa, Lemon Grove and Spring Valley Irrigation District reorganizes. Lemon Grove residents form a volunteer fire department after two homes burn to the ground. Ed Fletcher sells the Cuyamaca Water Company system to the La Mesa, Lemon Grove and Spring Valley Irrigation District for $1.2 million. Charles Miller opens the Miller Dairy on 15.77 acres. At its height it produced 2,500 gallons of milk daily selling milk from a drive-through store on Mt. Vernon Avenue. The second Lemon Grove Chamber of Commerce is formed. William H West, owner of a large lemon grove, is the first President. It incorporates in 1947 and merges with the East County Chamber of Commerce in 2008. Church of St. Theresa of the Child Jesus, Chapel for Mexican Catholics in Lemon Grove is established by Father Joseph Mesny at 51 Lemon Avenue. The famous Lemon Grove lemon was built for use in the Fiesta de San Diego parade. The sixteen year old Amorita Treganza is named the first Miss Lemon Grove. Lemon Grove’s Main Street is paved. The H. Lee House, a Tudor Revival mansion, is built on Troy Lane, overlooking Spring Valley. The Lemon Grove Lemon is plastered and painted. The Big Lemon served as a parade float until 1932. It became a permanent town symbol in 1932. “The Lemon Grove Incident.” Lemon Grove Grammar School trustees order the school closed to Mexican children. The resulting law suit, Alvarez vs. Lemon Grove School Board, becomes the nation’s first successful school desegregation case after San Diego Superior Court judge Claude Chambers rules in favor of the Mexican-American plaintiff families on Mar. 11, 1931. The case becomes precedent for the 1946 Mendez case in Los Angeles and the landmark 1953 Brown case in Topeka, Kansas. The “Campo Highway” paving is completed through to Campo. The original train station in Lemon Grove — built by the San Diego, Cuyamaca & Eastern Railroad — is torn down. Saint John of the Cross Church is built. It is enlarged to a seating capacity of 525 in 1952. The parish school is established in 1948 for 187 children. St. John of the Cross holds the first Mission Rancho Horse Show to raise funds for a parish school, and eventually to build a larger church.. The show brought out famous cowboys like Buffalo Bill Cody and Hollywood stars Roy Rogers, Dale Evans and their horse, “Trigger.” The rodeo, fiesta and associated activities were held annually for 17 years. Japanese row farmers in Lemon Grove ordered into the internment camp at Poston (Yuma County). Lemon Grove residents rallied around their Japanese-American neighbors, and protected their property and possessions until they returned home from Arizona. The First Baptist Church of Lemon Grove is established at 2910 Main Street. Lemon Grove Review. The first successful locally owned and operated newspaper is printed in Lemon Grove. Max Goodman buys the paper in 1952. He was the editor and publisher for the next 37 years. The Lemon Bowl Cinema Dine drive-in theater opens on Federal Blvd. It is San Diego County’s second drive-in. With a restaurant on site, patrons could order food brought to their car. It closed in 1953 to make way for the route of the new freeway (SR-94) which would replace highway 94. First National Bank opens as Lemon Grove’s first bank. Lemon Grove Fire Protection District formed. H.L. “Pappy” Hensley was appointed Chief in December, 1951. Lemon Grove incorporation election fails by vote of Yes: 1607; No: 2180. Construction begins on the freeway project which will widen Highway 94 from San Diego through Lemon Grove to four lanes in each direction and provide a connector to Interstate 8 in La Mesa. The Ace Drive-in theater opens on Imperial Avenue. It closes in 1986 to make way for a 161 unit apartment complex. The La Mesa, Lemon Grove and Spring Valley Irrigation District is renamed Helix Irrigation District. The name would be changed to the Helix Water District in 1973. The Lemon Grove Medical Center, 3232 Main Street, is built by Drs. Simon Brumbaugh and Wesley Herbert. The complex will later become Lemon Grove’s City Hall and a Sheriff’s sub-station. Lemon Grove’s second incorporation attempt defeated 2,762 to 2,249. The City of San Diego annexes the College Grove area away from Lemon Grove. San Diego’s first suburban shopping mall will open two years later. Fire destroys the last citrus packing shed and two adjacent buildings. The packing house was built in 1891 north of the railroad tracks in Lemon Grove. Lemon Grove’s third incorporation effort fails. The historic old St. Paul’s Church of San Diego, a Gothic Revival building, built in 1887 at 8th and “C” Streets in San Diego, is moved from the state college area to Lemon Grove and rededicated as St. Philip’s Episcopal Church. Lemon Grove Incorporates and becomes the City of Lemon Grove. The measure passes by a wide margin: 3250 voting Yes (68%), 1527 voting No (31.9%). The Lemon Grove Fire Protection District becomes the city fire department. The City contracts with the San Diego County Sheriff for police protection. Lemon Grove Historical Society is formed. The Metropolitan Transit Development Board (MTDB) purchases the San Diego Arizona & Eastern Railroad (S.D.A.&E.) including its trackage through Lemon Grove. City of Lemon Grove buys the Lemon Grove Medical Center and begins renovation. The City of Lemon Grove moves its offices from leased space at 3568 Main Street, Suite C, to 3232 Main Street. The facility includes the Sheriff substation serving Lemon Grove, Spring Valley, Bonita and East County communities along the Highway 94 corridor. The Lemon Grove Recreation Center is built on the grounds of Lemon Grove Junior High in a joint venture with the Lemon Grove School District. Miller Dairy is sold for residential development. A duplicate of the original 1895 train depot is built one block north of the original station location. The architect is Arthur Decker. The City owns the depot. The Metropolitan Transit System (MTS) owns the platform, tracks and right-of-way. The building houses the Lemon Grove Chamber of Commerce. Lemon Groves opens its new fire station at Central Avenue and School Lane. Trolley service begins on the “East Line” of the San Diego Trolley System (SDTI). The Lemon Grove Senior Center, 8215 Mt. Vernon, is built in the northeast corner of Lemon Grove Park. Fireman’s Park at Central and School Lane is built opposite the fire station. The City completes the purchase of the second Congregational Church, Friendship Hall and the land around it. In 2003 this property becomes Civic Center Park, home of the Parsonage Museum and H. Lee House Cultural Center. The City contracts out fire service. The San Miguel Consolidated Fire Protection District absorbs the City Fire Department and provides service. Lemon Grove’s hometown newspaper, The Lemon Grove Review, publishes its last edition. The Lemon Grove Historical Society’s Parsonage Museum opens on Sept. 26 after 2.5 years of rehabilitation. The H. Lee House is moved to its present site in Civic Center Park. Restoration work begins. The house opens in 2004 for events and rentals. Civic Center Park is created. It serves as a home for two historic Lemon Grove buildings and a passive park near the central business district. The contract for fire service expires. The City resumes operation of its own fire department. Lemon Grove and the cities of La Mesa and El Cajon agree to “co-manage” fire and emergency medical services under the name Heartland Fire and Rescue. The Lemon Grove Patch begins publishing a digital newspaper. The new joint-use Lemon Grove Library opens. City council member Racquel Vasquez becomes mayor of Lemon Grove. Mayor Vasquez is the first African American woman elected to serve as a city mayor in San Diego County. 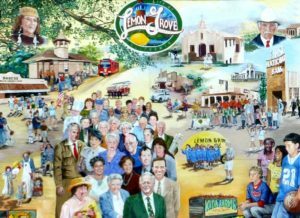 Lemon Grove celebrates its 40th anniversary as a City. The Helix Water District removes the last large stretch of cast iron pipe from the water distribution system serving Lemon Grove. The pipes had been installed between 1926 and 1949.